Purvis Stevens LLP is an ACCA member firm of two partners supported by a team of professional staff, all of whom are fully qualified accountants. We are committed to maintaining a strong and professional team with an emphasis on interpersonal skills. We offer a professional service in a friendly manner with the primary aim of giving clear advice on complex issues. As a business, our philosophy is to establish a one to one relationship with every client. We believe that a quality service is achieved by continual communication with our clients. This way every client has the appropriate advice and support at the right time for their business. Gavin grew up in Cornwall after moving around the world with his army officer father. He graduated in 1975 with an honours degree in accountancy and qualified in the city of London in 1978 giving him over 35 years experience within the profession. He has had a keen interest in rugby from an early age and that passion for the sport has continued to this day. He is currently President of Sutton and Epsom RFC. 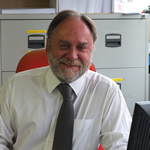 Barry has in excess of 35 years experience giving tax advice within the profession and in industry. His career originally began working at the Inland Revenue and has gone skywards since then. He is a "flying maverick" in his spare time having attained an RAF scholarship at 17 and gaining his pilot's licence before he could drive. As flying jets for a living was not to be he still keeps his hand in regularly taking off from Redhill aerodrome in Surrey. He has even been known to take several clients up for a spin.